Cathy Terukina is V.P. Administration for The Gazette Company. She oversees all the content gatherers for The Gazette and KCRG-TV, in addition to managing Human Resources and Organizational Development. Terukina started at The Gazette Company in 2005. Her current responsibilities represent The Gazette Company’s efforts to inject new thinking into the management of its newsgathering enterprises. Cathy Terukina, V.P. administration, Source Media, The Gazette, says they’re asking, “How do we re-imagine the way we engage with our communities? How do we re-imagine our role as a journalist?” “We’ve spent a lot of time,” says Terukina, “thinking about how a journalist should and would engage and act and go about their work in this new environment.” In this interview Terukina explains many of the questions her reporting staff is probing. 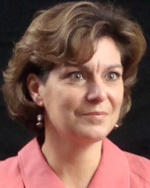 Cathy Terukina, V.P. administration, Source Media, The Gazette, says her news organization wants to “help the community grow and thrive.” To rationalize their newsgathering operations, Source Media is merging its TV and newspaper reporting staffs into one “common newsroom.” Terukina says she is working to meld two cultures – TV reporters and print reporters. “We need these groups to work together,” she says.